Ok, now those who raised your hand can go wallow in shame while the rest of you can continue reading this review. One of the best loved and most important trilogies in horror history, Romero's zombie trilogy mixes political and humanist themes with oodles of blood, gore and entrails. It is not surprising then that fans would want to see the locations used for these masterpieces...and if you (like me) are one of those fans, this is the DVD for you. 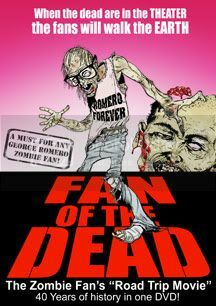 Fan of the Dead is a travelogue of sorts, filmed by French Romero fan Nicolas Garreau who traveled to the United States (mainly the Pittsburgh area) to visit all of the filming locations used in the Dead trilogy. We see the basement where Night of the Living Dead was filmed, the Monroeville Mall where Dawn of the Dead was filmed and the underground bunker used in Day of the Dead. We also follow Garreau as he travels to a convention featuring many of the stars of Dawn of the Dead as well as a tour through the Monroeville Mall by Dawn of the Dead star Ken Foree. Almost every location used (even minor locations that are briefly seen) in the films are visited and shown to see how different (or similar) they look now, as well as a few nearby locations used in the Night of the Living Dead remake and Romero's Creepshow. Fan of the Dead shines for a few different reasons. The first is just how many different locations we get to see and people we meet along the way (cast, crew, locals). Garreau's optimism and excitement for traveling across the Atlantic to visit these sacred horror grounds is apparent and his enthusiasm is contagious. I found myself very entertained throughout the film and anxious to see where I would be taken next. This is a great companion piece to Roy Frumke's Document of the Dead documentary and a must have for all Romero fans. I could complain about the shaky camera work and the English narration, but for what the film is, it's perfect. Though casual fans might not get as much out of the film as die hard fans would, I'd say it's still an important piece of film making.